The simplified molecular-input line-entry system (SMILES) is a specification in form of a line notation for describing the structure of chemical species using short ASCII strings. 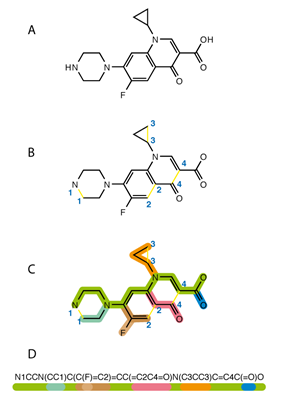 SMILES strings can be imported by most molecule editors for conversion back into two-dimensional drawings or three-dimensional models of the molecules. The original SMILES specification was initiated by the author David Weininger at the USEPA Mid-Continent Ecology Division Laboratory in Duluth in the 1980s. Acknowledged for their parts in the early development were "Gilman Veith and Rose Russo (USEPA) and Albert Leo and Corwin Hansch (Pomona College) for supporting the work, and Arthur Weininger (Pomona; Daylight CIS) and Jeremy Scofield (Cedar River Software, Renton, WA) for assistance in programming the system." The Environmental Protection Agency funded the initial project to develop SMILES. It has since been modified and extended by others, most notably by Daylight Chemical Information Systems. In 2007, an open standard called "OpenSMILES" was developed by the Blue Obelisk open-source chemistry community. Other 'linear' notations include the Wiswesser Line Notation (WLN), ROSDAL and SLN (Tripos Inc). In July 2006, the IUPAC introduced the InChI as a standard for formula representation. SMILES is generally considered to have the advantage of being slightly more human-readable than InChI; it also has a wide base of software support with extensive theoretical (e.g., graph theory) backing. The term SMILES refers to a line notation for encoding molecular structures and specific instances should strictly be called SMILES strings. However, the term SMILES is also commonly used to refer to both a single SMILES string and a number of SMILES strings; the exact meaning is usually apparent from the context. The terms "canonical" and "isomeric" can lead to some confusion when applied to SMILES. The terms describe different attributes of SMILES strings and are not mutually exclusive. Typically, a number of equally valid SMILES strings can be written for a molecule. For example, CCO, OCC and C(O)C all specify the structure of ethanol. Algorithms have been developed to generate the same SMILES string for a given molecule; of the many possible strings, these algorithms choose only one them. This SMILES is unique for each structure, although dependent on the canonicalization algorithm used to generate it, and is termed the canonical SMILES. These algorithms first convert the SMILES to an internal representation of the molecular structure; an algorithm then examines that structure and produces a unique SMILES string. Various algorithms for generating canonical SMILES have been developed and include those by Daylight Chemical Information Systems, OpenEye Scientific Software, MEDIT, Chemical Computing Group, MolSoft LLC, and the Chemistry Development Kit. A common application of canonical SMILES is indexing and ensuring uniqueness of molecules in a database. The original paper that described the CANGEN algorithm claimed to generate unique SMILES strings for graphs representing molecules, but the algorithm fails for a number of simple cases (e.g. cuneane, 1,2-dicyclopropylethane) and cannot be considered a correct method for representing a graph canonically. There is currently no systematic comparison across commercial software to test if such flaws exist in those packages. SMILES notation allows the specification of configuration at tetrahedral centers, and double bond geometry. These are structural features that cannot be specified by connectivity alone and SMILES which encode this information are termed isomeric SMILES. A notable feature of these rules is that they allow rigorous partial specification of chirality. The term isomeric SMILES is also applied to SMILES in which isotopes are specified. In terms of a graph-based computational procedure, SMILES is a string obtained by printing the symbol nodes encountered in a depth-first tree traversal of a chemical graph. The chemical graph is first trimmed to remove hydrogen atoms and cycles are broken to turn it into a spanning tree. Where cycles have been broken, numeric suffix labels are included to indicate the connected nodes. Parentheses are used to indicate points of branching on the tree. An atom holding one or more electrical charges is enclosed in brackets, followed by the symbol H if it is bonded to one or more atoms of hydrogen, followed by the number of hydrogen atoms (as usual one is omitted example: NH4 for ammonium), then by the sign '+' for a positive charge or by '-' for a negative charge. The number of charges is specified after the sign (except if there is one only); however, it is also possible write the sign as many times as the ion has charges: instead of "Ti+4", one can also write "Ti++++" (Titanium IV, Ti4+). Thus, the hydroxide anion is represented by [OH-], the oxonium cation is [OH3+] and the cobalt III cation (Co3+) is either [Co+3] or [Co+++]. Bonds between aliphatic atoms are assumed to be single unless specified otherwise and are implied by adjacency in the SMILES string. For example the SMILES for ethanol can be written as CCO. Ring closure labels are used to indicate connectivity between non-adjacent atoms in the SMILES string, which for cyclohexane and dioxane can be written as C1CCCCC1 and O1CCOCC1 respectively. For a second ring, the label will be 2 (naphthalene: c1cccc2c1cccc2 (note the lower case for aromatic compounds)), and so on. After reaching 9, the label must be preceded by a '%', in order to differentiate it from two different labels bonded to the same atom (~C12~ will mean the atom of carbon holds the ring closure labels 1 and 2, whereas ~C%12~ will indicate one label only, 12). Double, triple, and quadruple bonds are represented by the symbols '=', '#', and '$' respectively as illustrated by the SMILES O=C=O (carbon dioxide), C#N (hydrogen cyanide) and [Ga-]$[As+] (gallium arsenide). Aromatic C, O, S and N atoms are shown in their lower case 'c', 'o', 's' and 'n' respectively. Benzene, pyridine and furan can be represented respectively by the SMILES c1ccccc1, n1ccccc1 and o1cccc1. Bonds between aromatic atoms are, by default, aromatic although these can be specified explicitly using the ':' symbol. Aromatic atoms can be singly bonded to each other and biphenyl can be represented by c1ccccc1-c2ccccc2. Aromatic nitrogen bonded to hydrogen, as found in pyrrole must be represented as [nH] and imidazole is written in SMILES notation as n1c[nH]cc1. The Daylight and OpenEye algorithms for generating canonical SMILES differ in their treatment of aromaticity. Branches are described with parentheses, as in CCC(=O)O for propionic acid and C(F)(F)F for fluoroform. Substituted rings can be written with the branching point in the ring as illustrated by the SMILES COc(c1)cccc1C#N (see depiction) and COc(cc1)ccc1C#N (see depiction) which encode the 3 and 4-cyanoanisole isomers. Writing SMILES for substituted rings in this way can make them more human-readable. Configuration around double bonds is specified using the characters "/" and "\". For example, F/C=C/F (see depiction) is one representation of trans-difluoroethene, in which the fluorine atoms are on opposite sides of the double bond, whereas F/C=C\F (see depiction) is one possible representation of cis-difluoroethene, in which the Fs are on the same side of the double bond, as shown in the figure. Configuration at tetrahedral carbon is specified by @ or @@. L-Alanine, the more common enantiomer of the amino acid alanine can be written as N[C@@H](C)C(=O)O (see depiction). The @@ specifier indicates that, when viewed from nitrogen along the bond to the chiral center, the sequence of substituents hydrogen (H), methyl (C) and carboxylate (C(=O)O) appear clockwise. D-Alanine can be written as N[C@H](C)C(=O)O (see depiction). The order of the substituents in the SMILES string is very important and D-alanine can also be encoded as N[C@@H](C(=O)O)C (see depiction). Isotopes are specified with a number equal to the integer isotopic mass preceding the atomic symbol. Benzene in which one atom is carbon-14 is written as [14c]1ccccc1 and deuterochloroform is [2H]C(Cl)(Cl)Cl. Note that '%' appears in front of the index of ring closure labels above 9; see section Bonds above. The SMILES notation is described extensively in the SMILES theory manual provided by Daylight Chemical Information Systems and a number of illustrative examples are presented. Daylight's depict utility provides users with the means to check their own examples of SMILES and is a valuable educational tool. SMARTS is a line notation for specification of substructural patterns in molecules. While it uses many of the same symbols as SMILES, it also allows specification of wildcard atoms and bonds, which can be used to define substructural queries for chemical database searching. One common misconception is that SMARTS-based substructural searching involves matching of SMILES and SMARTS strings. In fact, both SMILES and SMARTS strings are first converted to internal graph representations which are searched for subgraph isomorphism. SMIRKS is a line notation for specifying reaction transforms. SMILES can be converted back to 2-dimensional representations using Structure Diagram Generation algorithms (Helson, 1999). This conversion is not always unambiguous. Conversion to 3-dimensional representation is achieved by energy minimization approaches. There are many downloadable and web-based conversion utilities. International Chemical Identifier (InChI), the free and open alternative to SMILES by the IUPAC. ^ Weininger, Dave. "Acknowledgements on Daylight Tutorial smiles-etc page". Retrieved 24 June 2013. ^ "SMILES Tutorial: What is SMILES?". U.S. Environmental Protection Agency. Retrieved 2012-09-23. ^ Byers, J. A.; Birgersson, G.; Löfqvist, J.; Appelgren, M.; Bergström, G. (1990). "Isolation of pheromone synergists of bark beetle, Pityogenes chalcographus, from complex insect-plant odors by fractionation and subtractive-combination bioassay". Journal of Chemical Ecology 16 (3): 861–76. Anderson, E.; Veith, G. D.; Weininger, D. (1987). SMILES: A line notation and computerized interpreter for chemical structures. Duluth, MN: U.S. EPA, Environmental Research Laboratory-Duluth. Report No. EPA/600/M-87/021. Helson, H. E. (1999). "Structure Diagram Generation". In Lipkowitz, K. B.; Boyd, D. B. Rev. Comput. Chem. 13. New York: Wiley-VCH. pp. 313–398. Weininger, David (February 1988). "SMILES, a chemical language and information system. 1. Introduction to methodology and encoding rules". Journal of Chemical Information and Modeling 28 (1): 31–6. Weininger, David; Weininger, Arthur; Weininger, Joseph L. (May 1989). "SMILES. 2. Algorithm for generation of unique SMILES notation". Journal of Chemical Information and Modeling 29 (2): 97–101. Weininger, David (August 1990). "SMILES. 3. DEPICT. Graphical depiction of chemical structures". Journal of Chemical Information and Modeling 30 (3): 237–43.